Meet Amanda and Victoria, our fabulous Patient Care Coordinators! Have any acne, pigmentation, or general skincare concerns? We definitely recommend Zo Skin Health products to get you skin ready! Give us a call (415) 392-3333 to schedule your complimentary consultation with our skincare experts. SAN FRANCISCO, CALIFORNIA – March 15, 2019 – With incontinence affecting over 19 million women in the US, Board-Certified Plastic Surgeon, Dr. Usha Rajagopal, and her team at the San Francisco Plastic Surgery and Laser Center are excited to introduce a breakthrough technology from BTL Industries. BTL EMSELLA™ stimulates the entire pelvic floor region and musculature by rehabilitating weak pelvic muscles and restoring neuromuscular control. BTL EMSELLA™ is revolutionizing the women’s intimate health and wellness category, by effectively treating urinary incontinence. Additionally, the technology provides women with an easy, effective and completely non-invasive treatment option, empowering them to address an often private health issue that can dramatically impact their quality of life. Incontinence is actually caused by a weakening of the muscles within the pelvic floor region, often a result of childbirth, menopause and the natural aging process. Although incontinence is extremely common, 5 out of 10 women do not seek help, according to the National Association for Continence (NAFC), which can have a dramatic effect on a woman’s self-esteem and confidence. Harnessing the power of HIFEM (High-Intensity Focused Electromagnetic) technology, BTL EMSELLA™ stimulates the entire pelvic floor at once—with a single session providing thousands of supramaximal pelvic floor muscle contractions, comparable to thousands of Kegels. Supramaximal pelvic floor muscle contractions are extremely important in muscle re-education of incontinent patients. A recent clinical study demonstrated that 100% of patients had better awareness of pelvic floor muscles as a result of treatment, with 95% of patients treated reported satisfaction and significant improvement in their quality of life following six treatments with BTL EMSELLA™. BTL EMSELLA™ serves as a complementary treatment to BTL ULTRA FEMME 360™ introduced earlier this year that rounds out the brand’s Pelvic Suite of treatments. When used together, the treatments address both internal and external pelvic health concerns of women providing a comprehensive approach to intimate health. For optimal results with BTL EMSELLA™, Dr. Rajagopal recommends a series of six, twice–weekly, 28 minute treatments. Dr. Usha Rajagopal is a pioneer in women’s wellness for over 20 years and is the first to address vaginal rejuvenation in the region. Combining her surgical expertise with a continued focus on client empathy and empowerment, Rajagopal began offering additional cutting-edge vaginal rejuvenation procedures like labiaplasty, monsplasty, vaginal tightening, Femilift, O-Shot, and now the Emsella. Each procedure is designed to instill a sense of pride in patients and meet their most intimate needs, whether related to pain, vaginal tightness, sexual dysfunction, urinary incontinence, aesthetic, or self-consciousness. Founded in 1993, BTL has grown to become one of the world’s major manufacturers of medical and aesthetic equipment. With over 1,500 employees located in more than 53 countries, BTL has revolutionized the way to offer the most advanced non-invasive solutions for women’s health & other medical treatments. BTL’s brands include BTL Emsella™, Emsculpt™, Exilis ULTRA 360™ with Ultra Femme 360™, BTL Vanquish ME™, and BTL Cellutone™. Additional information can be found at http://www.pelvicsuite.com. The quickest and simplest way to get rid of tired-looking eyes is cosmetic eyelid surgery, called blepharoplasty. As you age, the skin around your eyes loses its stretchiness and the muscles supporting your eyelids weaken. This causes loose folds of skin to develop on your upper eyelids, deep creases to appear under you lower eyelids and excess fat to accumulate around your eyes. In the end, you are left with drooping eyebrows, sagging skin on your upper lids and puffy bags underneath your eyes. This not only makes you look tired and older but can also impair your vision. 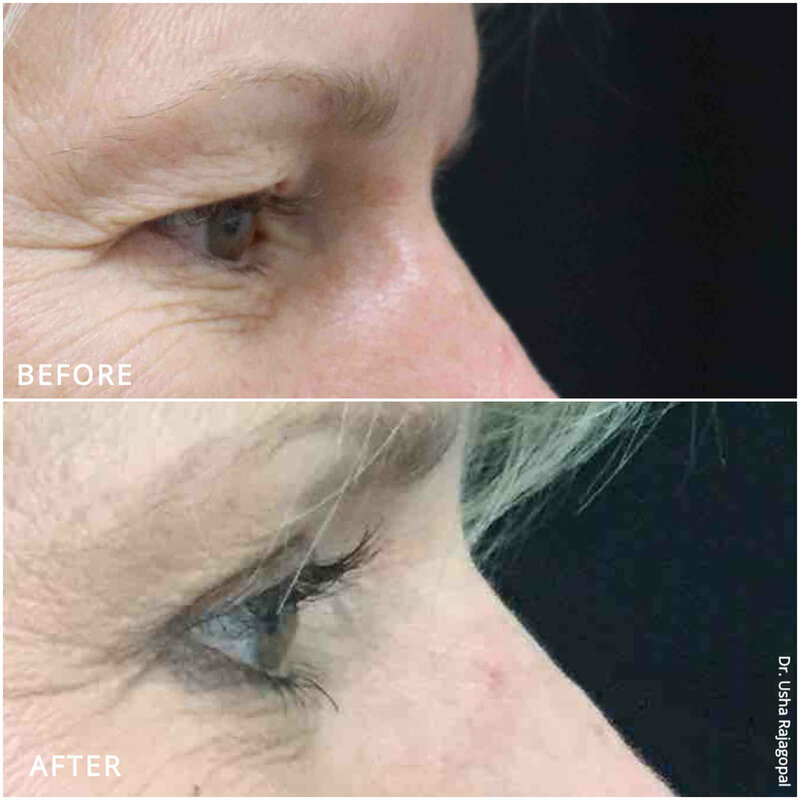 Cosmetic eyelid surgery offers a solution by removing this excess skin and/or fat from the eyelid area, making you look younger and more alert. Eyelid surgery generally takes between 1 to 3 hours, depending on the amount of tissue being removed and whether you are having your upper lids, lower lids or both done. It is usually done as an outpatient procedure—meaning you will be able to go home the same day—although some cases require an overnight stay in the hospital. It is usually done with lighter anesthesia such as twilight anesthesia. The surgeon will start the procedure by making tiny incisions into the natural creases and folds of the upper eyelids, as well as into the wrinkles at the corners of the eyes. The surgeon will then remove excess fat, muscle and loose skin before sewing the eyelid back together with tiny stitches. Then the surgeon will repeat the same technique on the lower lids, making incisions just below the eyelashes or inside the lower lid that extend into the laugh lines at the corners of the eyes. A highly skilled, certified plastic surgeon will ensure that any scars will be hidden by the natural folds of your eyes and will be practically invisible. Within a few weeks of your eyelid surgery, any swelling or bruising should completely disappear, revealing the final results – younger, more rested eyes. 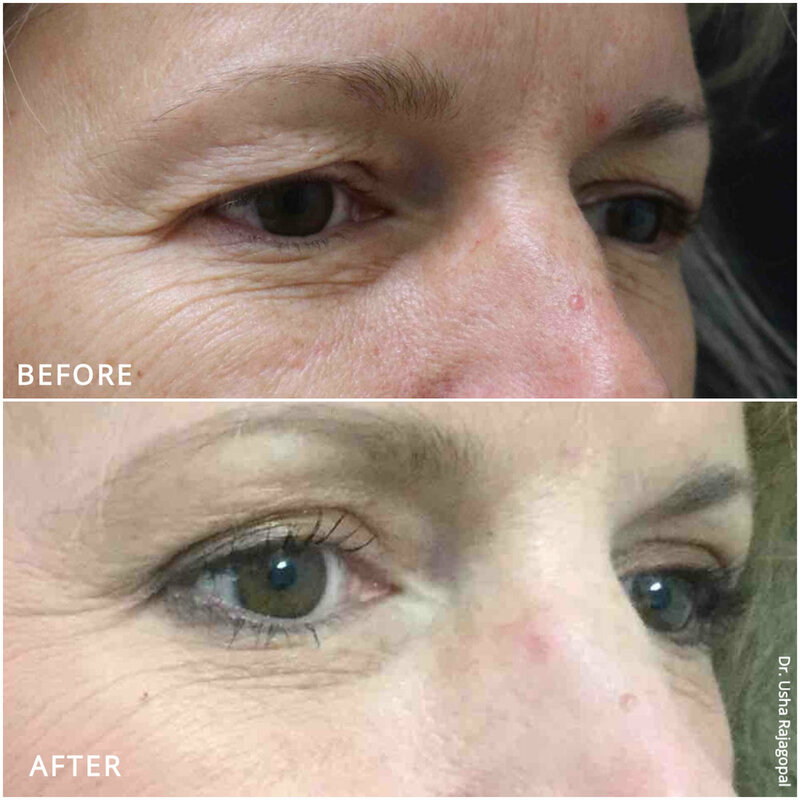 For some people, these results may last a lifetime, but for others eyelid drooping and sagging may reappear eventually. 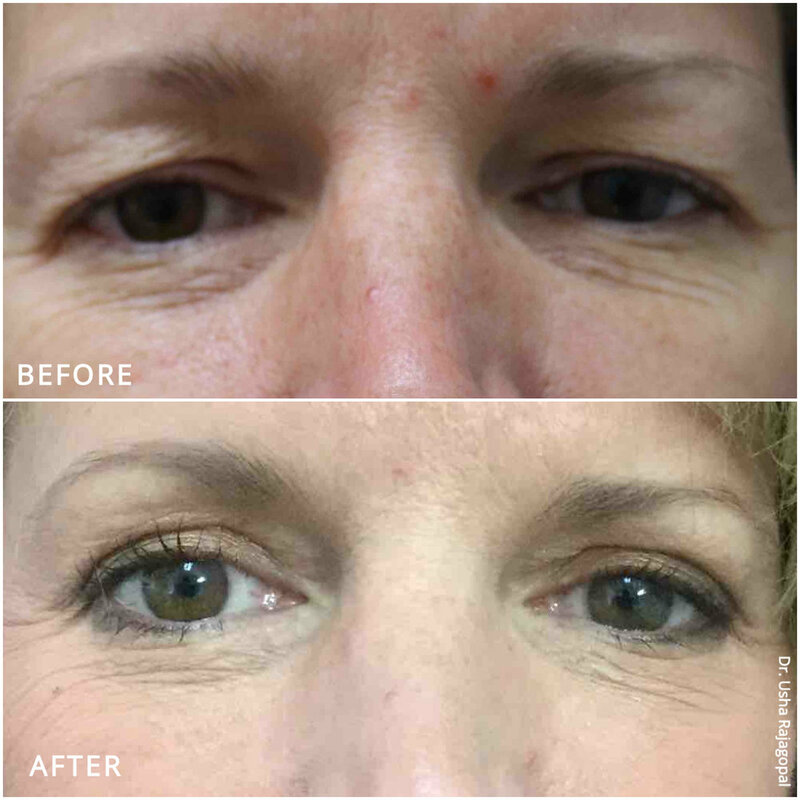 Cosmetic eyelid surgery will not eliminate laugh lines/crow’s feet, sagging eyebrows or dark circles under the eyes. As a result, you may choose to have other cosmetic procedures like a brow lift or facelift at the same time as your eyelid surgery in order to achieve the results you desire. Dr. Usha Rajagopal: Nowadays we have some excellent choices for treating the vertical lines around the lip area, both upper and lower lip. I usually recommend a combination of neurotransmitter. I generally like Botox. Most patients need anywhere between 2 and 6 units for the upper lip and, along with that you can do a thin filler like a Volbella or a Belotero. I personally feel like both give excellent results but Volbella tends to last a little bit longer, so my favorite duo combination for vertical lines is Botox with Volbella.